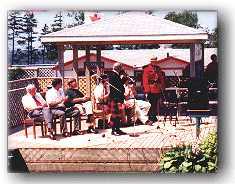 Lord Selkirk Park, Caledonia Highland Games, and Selkirk and Acadian Graves! Belfast, Lord Selkirk Park, P.E.I. Highland Games, and Selkirk and Acadian Graves! The following photos were taken during out camping trip to Lord Selkirk Park in Belfast, P.E.I. the weekend of the 31st of July, 1998. During this weekend, the P.E.I. Highland Games took place at the park, and I will include some photos from the games, some of the park, and the old acadian cemetery in the park, where the first few Selkirk settlers were buried! The P.E.I. Highland Games opening took place Saturday, August 1 at the park. Present were a number of notable people including the Hon. Pat Binns, premier of P.E.I. ; the Hon. Wilbur MacDonald, MLA for Belfast/Pownal Bay; Lawrence MacAulay, M.P. Cardigan District, a member of the federal cabinet; Sean MacLure, a representative of the RCMP, and many others. Cst. Shane Ryan, a representative of the Royal Canadian Mounted Police Force helps observe the 125th anniversary of the force (1873 - 1998), wearing the popular, but seldom seen, full dress uniform. Remind anyone of the series "Due South"? Click on photo for more information on the R.C.M.P., and on the highlight above for the R.C.M.P. home page. Local Highland Drummer and Piper help celebrate the opening! 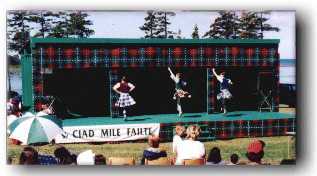 Highland Dancers entertain visitors to the Games, one of its many attractions! The games are an annual attraction at the park, presented by the Caledonian Club, and include Highland piping, drumming, dancing, and sports events, as well as a golf tournament at Belfast Highland Greens bordering the park. Just inside the entrance to the park, sits a memorial to the Selkirk settlers of 1803! 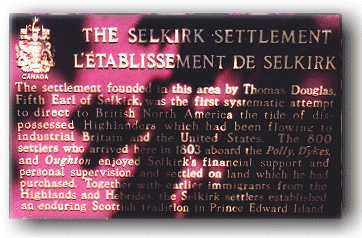 The Polly, Dykes, and Oughton carried Scots from their homeland to Lord Selkirk, Thomas Douglas's settlement here on P.E.I. The Polly and the Dykes arrived in early August, their passengers settling in the Belfast area, and the Oughton nearly a month later. Adjacent to the park, is beautiful Belfast Highland Greens, a 9 hole golf course which has developed a reputation for beauty, and challenging play to the most experienced golfer! To reserve tee-off times, call (902) 659-2794! On the left, as you enter Lord Selkirk Park, is an old Acadian Cemetery, in which some of the first Selkirk settlers were buried. 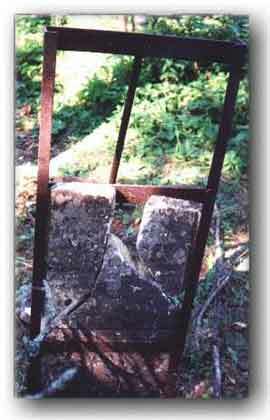 This photo depicts one of the remaining early sandstone memorials. Time has eroded all remnants of the inscriptions. Alexander Nicholson. 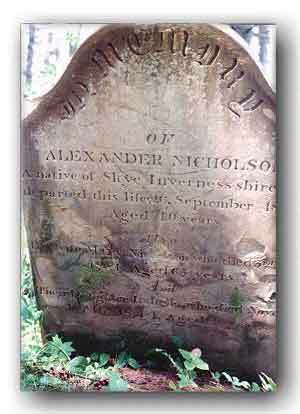 A native of Skye, Inverness shire, departed this life 26 September, 1820, ae 40 years. His wife, Mary Nicholson, who died 3rd May, 18(-1), aged 65 years. Their Daughter, Isabella, who died November 16, 1811?, aged 25 years. It is unfortunate that time has taken its toll on the stones, despite measures to preserve them. Visit the "Old Acadian Cemetery" Page! "Nearby, on the Point Prim Road is the famed "Polly" cemetery, and also nearby, is St. John's Belfast church where Mary Douglas, only daughter of the Lord Selkirk, and many of the settlers and their descendants are buried. Lord Selkirk is a beautiful park, where camping, golfing, community events and good old maritime fun come together with the rich history area, and of the friendly people of Belfast, P.E.I. As the sun sets over Lord Selkirk Park and beautiful Belfast Highland Greens, we prepare to leave, but not for long... We will always return, and look forward to our next trip. The beauty of the south shore and the unique nature of the Belfast region makes it a "must" stop on anyone's visit to P.E.I. 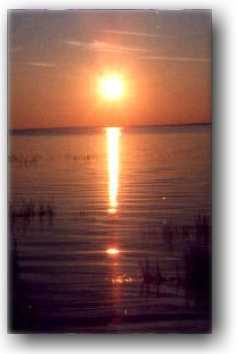 Lord Selkirk Provincial Park - Call (902) 659-7221 for reservations! Note 1 This stone can be identified. "Skye Pioneers and the Island", by Malcolm A. MacQueen states that on October 21, 1928, "In the same cemetery, two months earlier, there stood erect, in good repair, a marble stone inscribed as follows:- In Memory of Donald Martin, departed this life July 1, 1861 Aet 78. Emigrated to this Island 1803. And our souls are in eternal rest. For our bodies are not asleep, Dear friend for us do not weep. Also his wife, Ann, departed this life April 8, 1850, Aet 65. 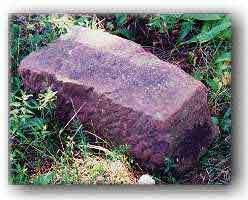 In the intervening two months this stone has been thrown down and broken, leaving as the sole watchman to mark this last resting place of sharers in an experiment noble in its philanthropy, but one poor slab of stone." Return to The Island Register's Main Page!